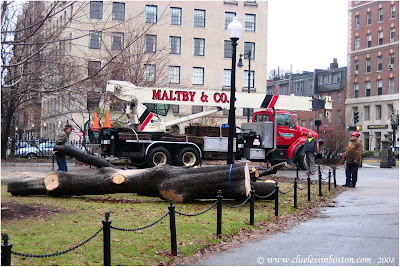 I saw a tree being removed from the Public Garden this week. I don't know whether it was diseased, or damaged in a recent storm, but it was a little shocking to see one of those magnificent trees chopped down. Nice shot of the work in progress. Too bad the tree had to go ... they can't replace the old ones very easily. Yes, sad. But there _had_ to be a reason.